Date & start time: Saturday 2nd January 2010. 10.55 am start. 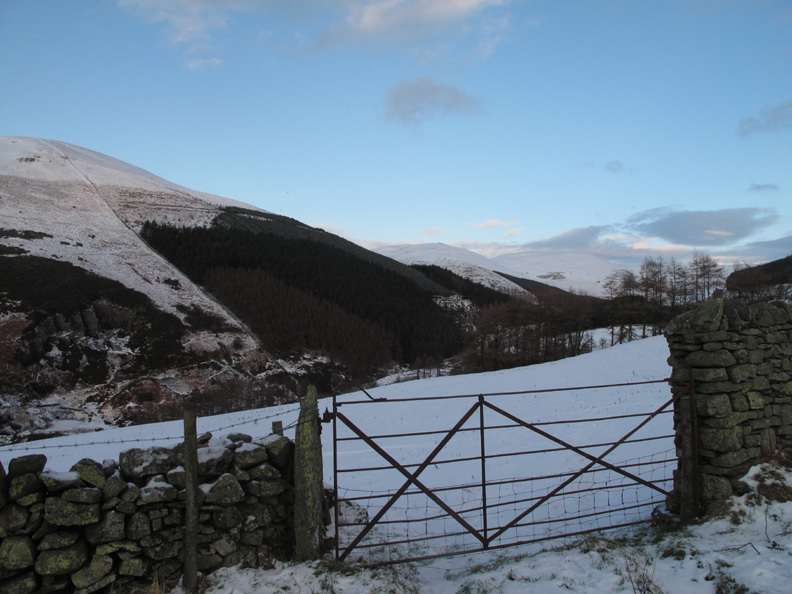 Places visited : Bridle way to Braithwaite Lodge, Barrow, Barrow Door, Stile End, Outerside and back via the Stonycroft Gill miner's track. Walk details : 5.25 mls, 1875 ft, 3 hrs 40 mins including lunch. 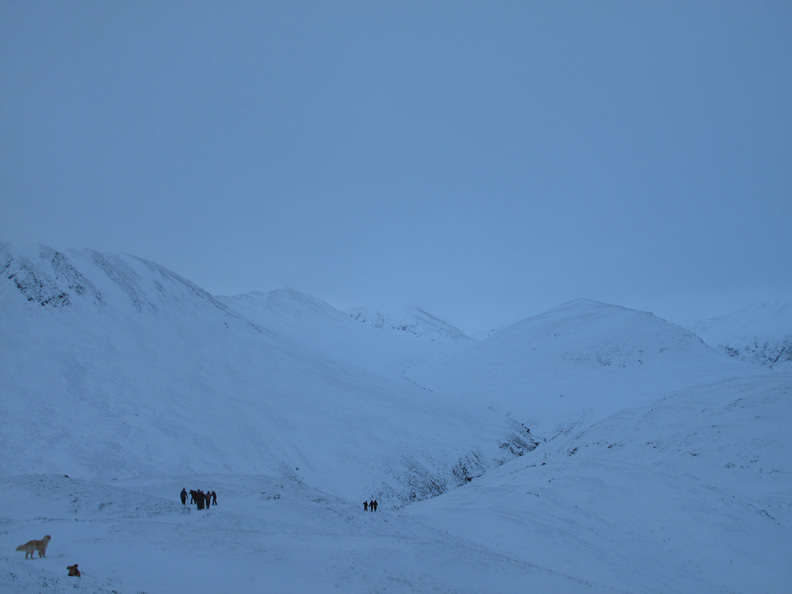 Walked with : John and David Hall, and the dogs, Polly, Harry and Bethan. 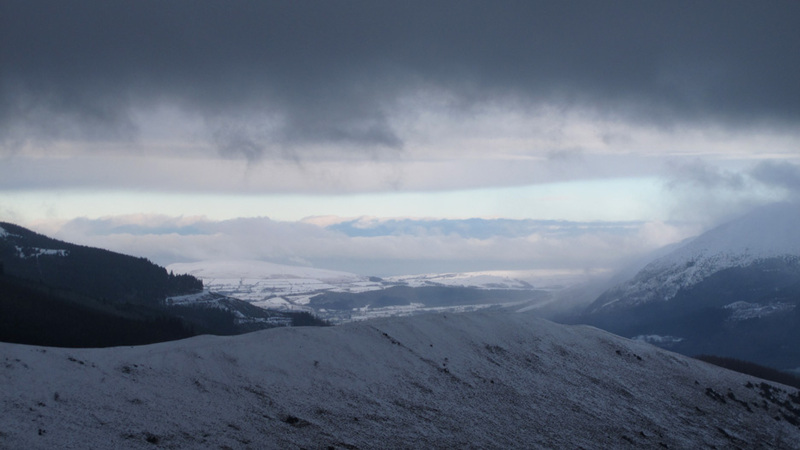 Weather : Overcast, snow showers and an occasional breeze. Distant sun. 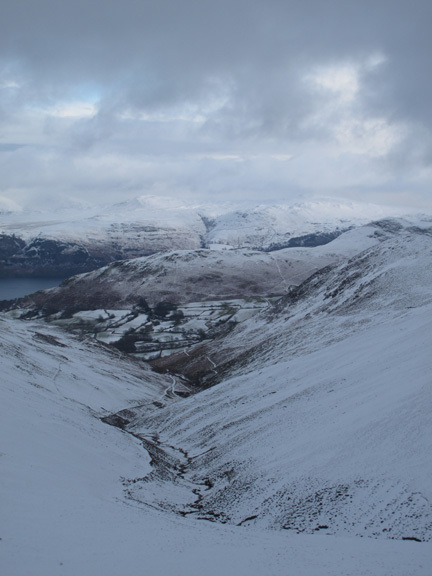 as we decide to walk two moderate summits in the North Western group of fells. 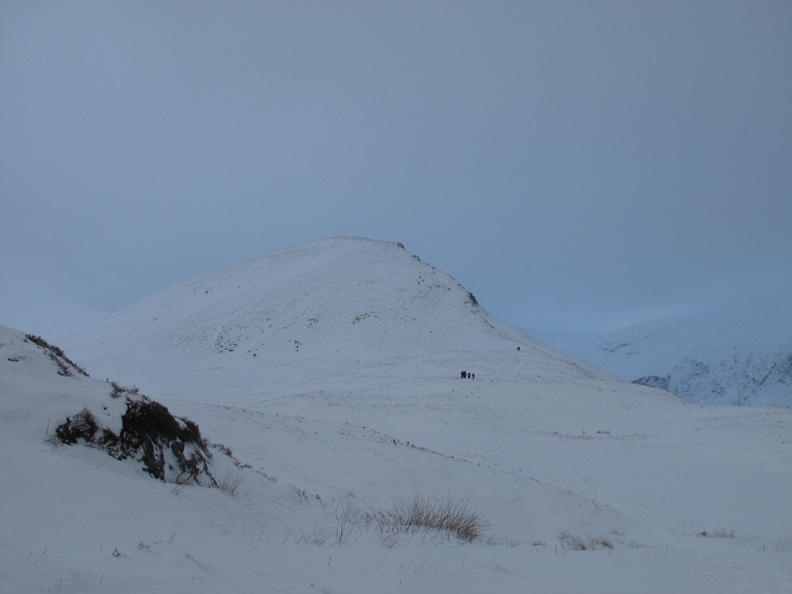 but away from the trodden routes the snow was easy walking ... provided it wasn't to deep ! Another light fall of snow on New Year's Eve and everything is white again. Unfortunately it's still cloudy so everything but the pub door and a patch of lichen on the walls falls within the black to white spectrum. and certainly not as much as other areas of Britain . . . however the black ice underneath the snow is just as slippery as everyone else's ! who introduced themselves to me in Fishers last week. 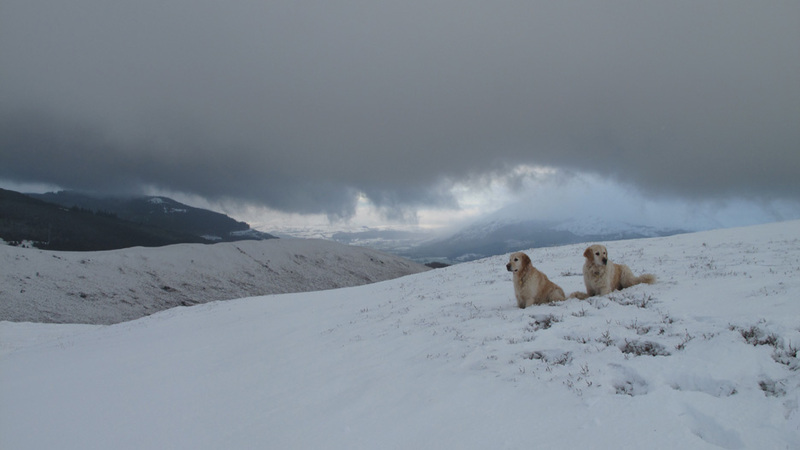 They are over from Holland and are enjoying walking the Lakeland hills. They've picked an interesting week ! 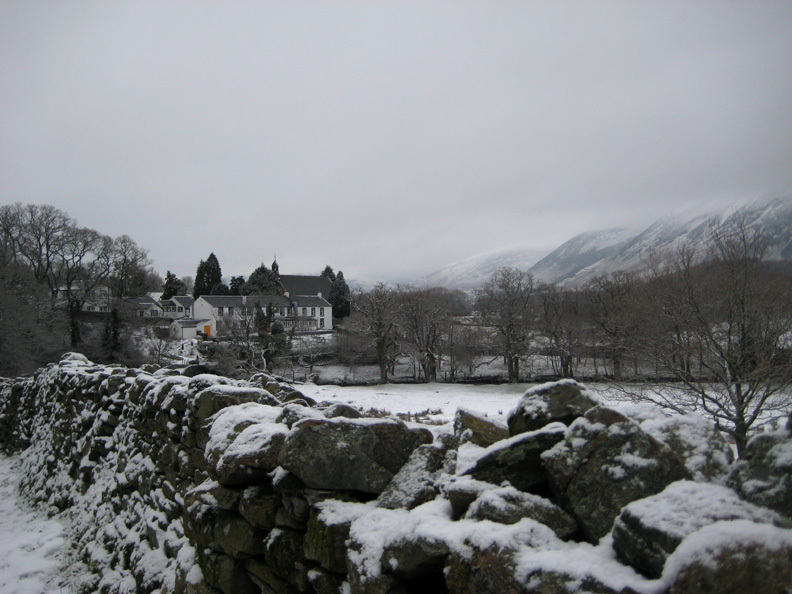 Our walk would take us up Barrow and across to Outerside passing the place where their photo was taken. 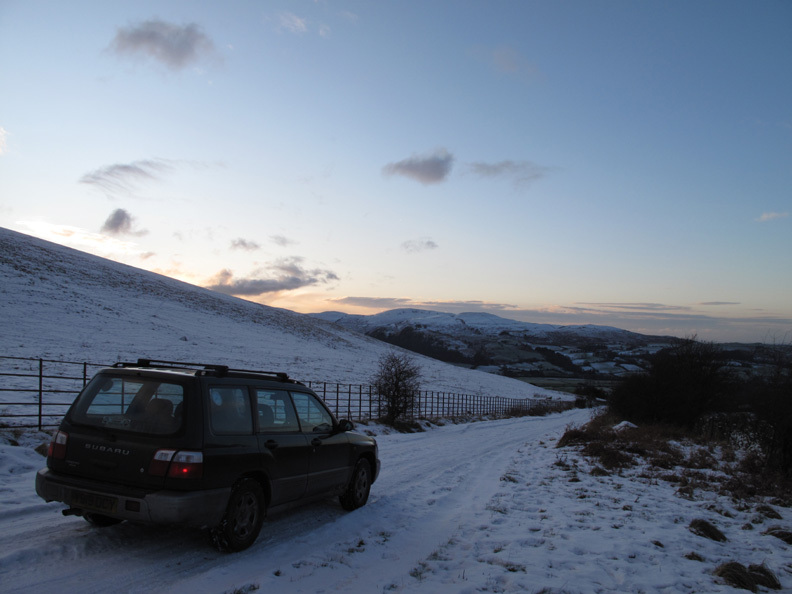 Our start point today however is roadside near Uzzicar Farm, as the off road parking near Stonycroft was downhill and very icy. 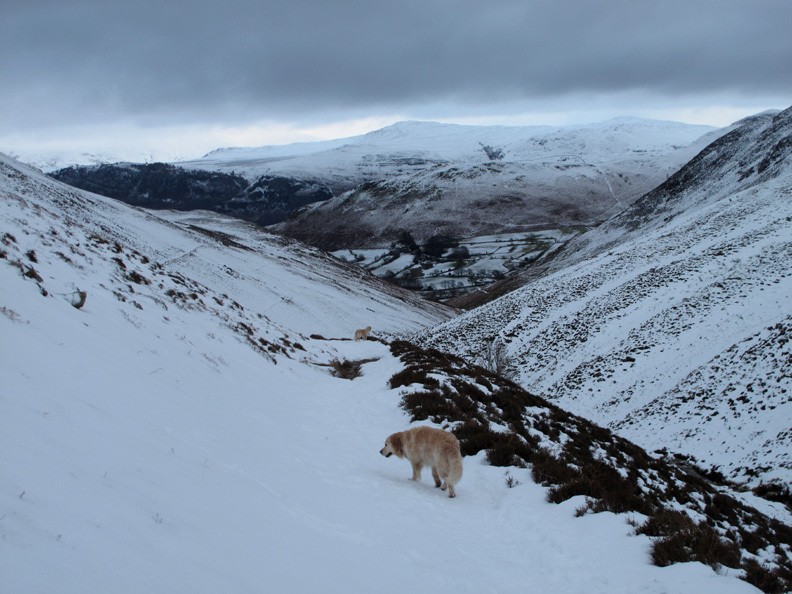 We would return down the Stonycroft Valley seen beyond the cars. 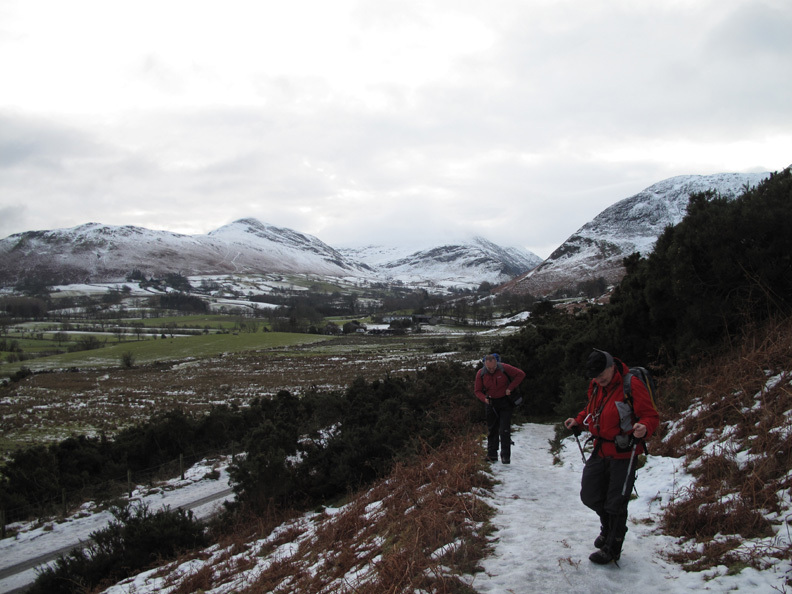 My companions today, David Hall and John, as we set off along the bridle way towards Braithwaite. 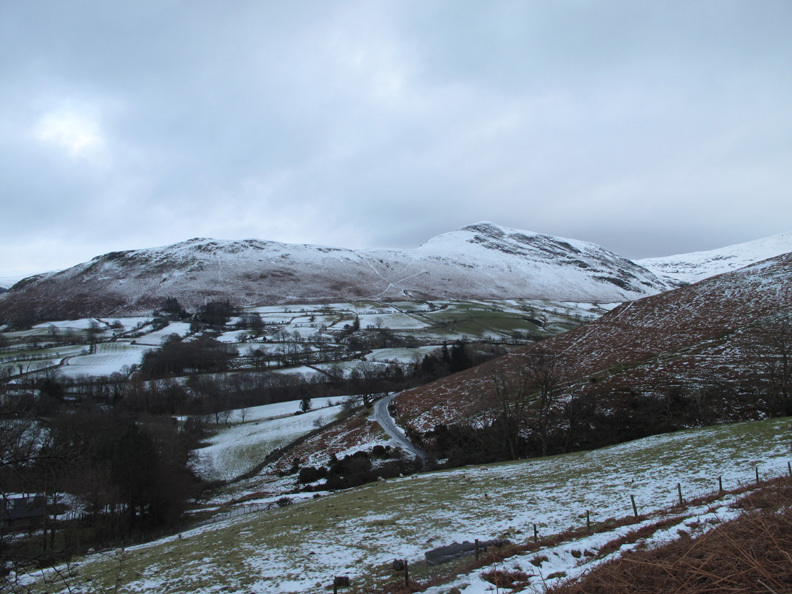 Our weather was what you might call "changeable". There is some blue sky about but also passing low clouds . 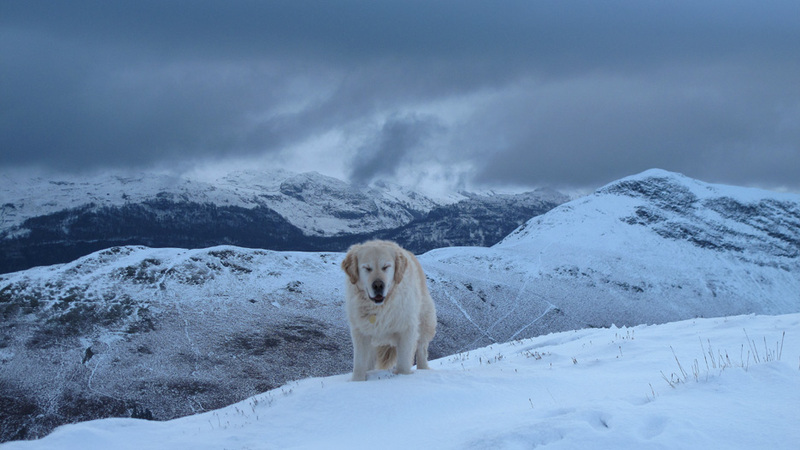 . . threatening snow at any time. 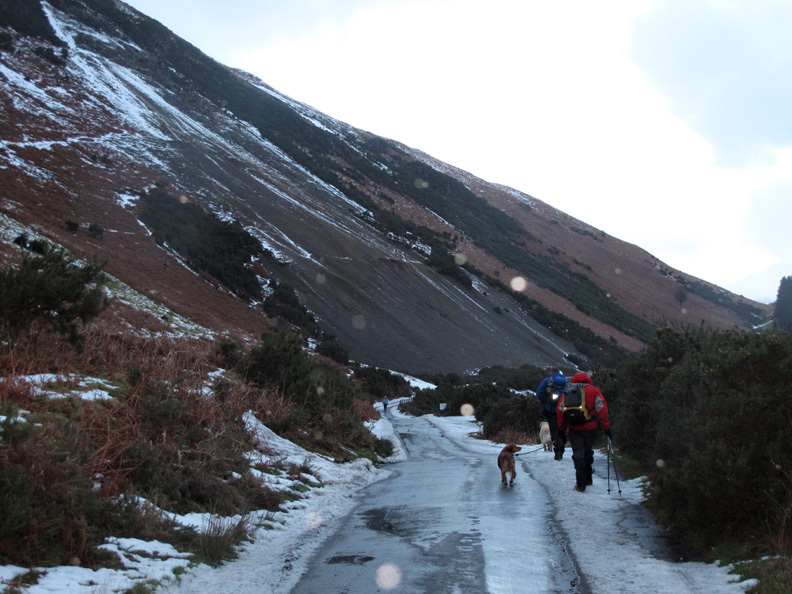 Harry leads us up around the side of Barrow, heading for the main ascent path from Braithwaite. The broad green path is covered in sheet ice and difficult to walk on. We have already fitted our spikes which allow us to walk anywhere we chose, but less fortunate folk have to walk up through the bracken. 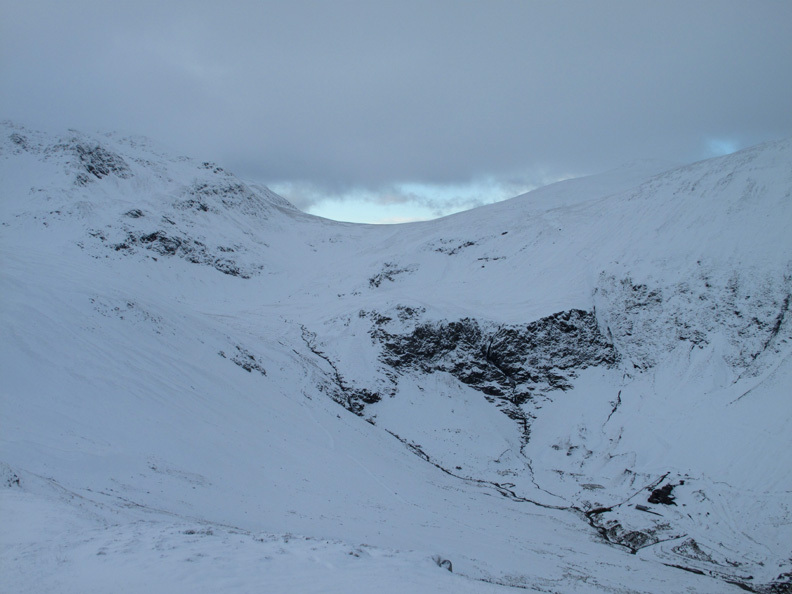 confusing the line between the white snow of the fells and the rich blue of the skies above. 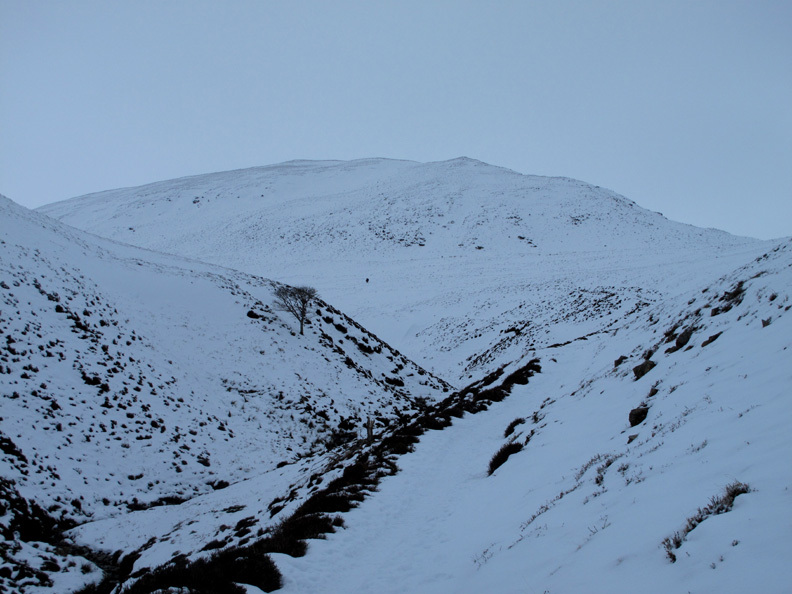 The path up Barrow, narrower now as we continue up the fell. 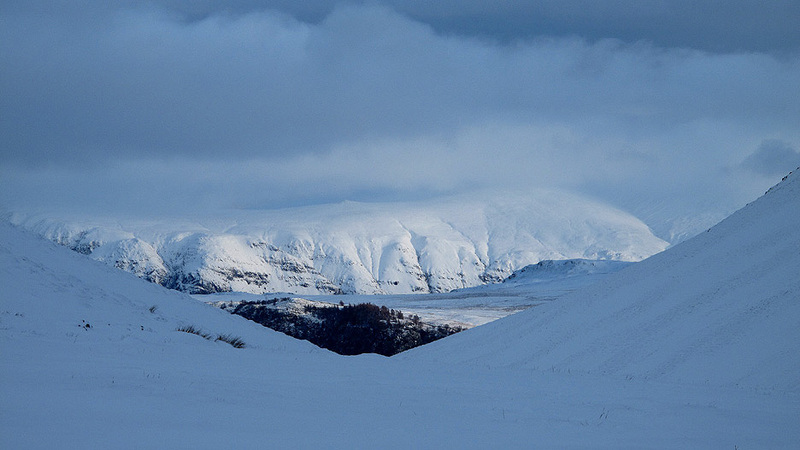 Outerside is the second of the two summits on the right hand side of the photo. 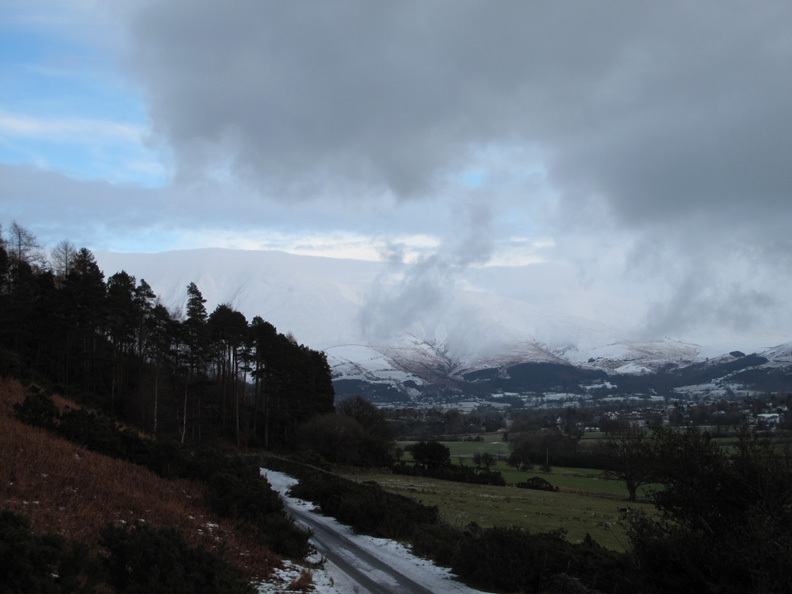 Further to our right, the outline of Grisedale Pike is also hidden by a patch of cloud over its summit. 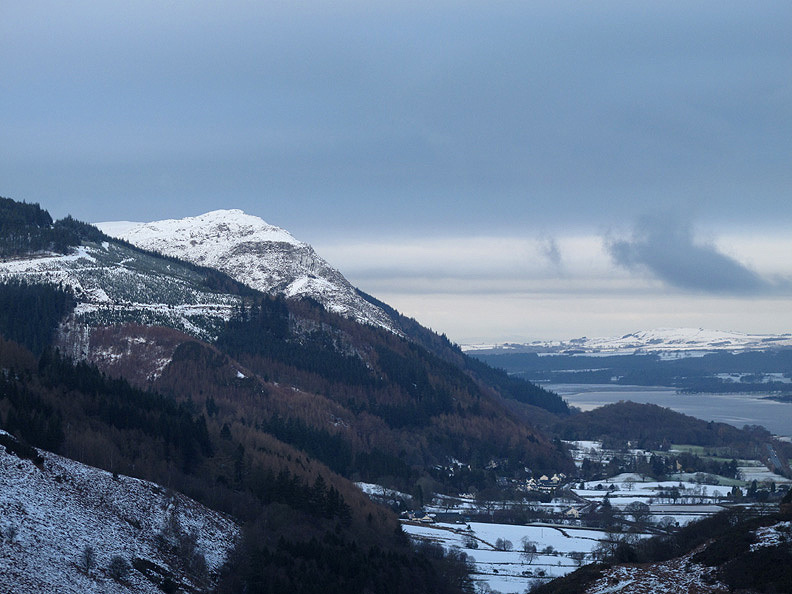 Clear air makes the snowy summit of Barf really stand out against the darker colours of Whinlatter Forestry. 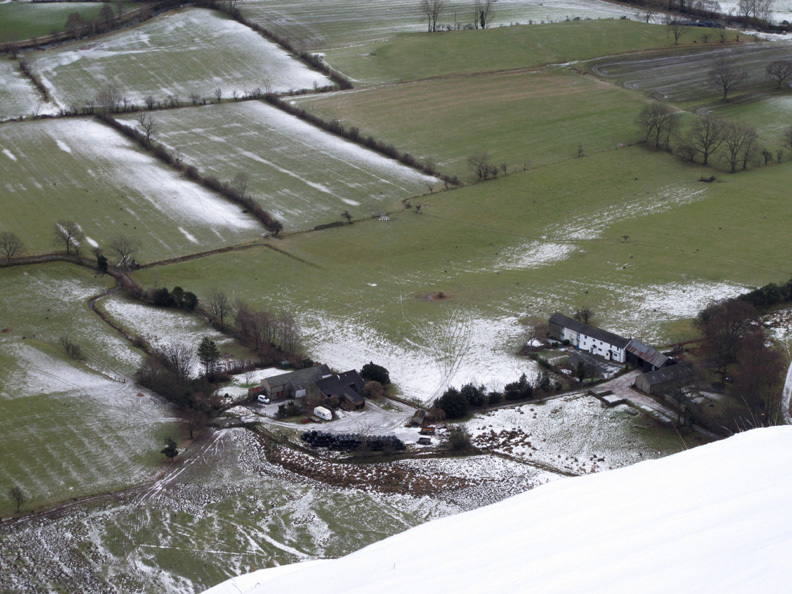 Way below us now is the farm of Uzzicar with remnants of snow on the fields. Darker skies over Derwent Water leaves Catbells in the shade. It's so cold that there are even Polar Bears up here ! 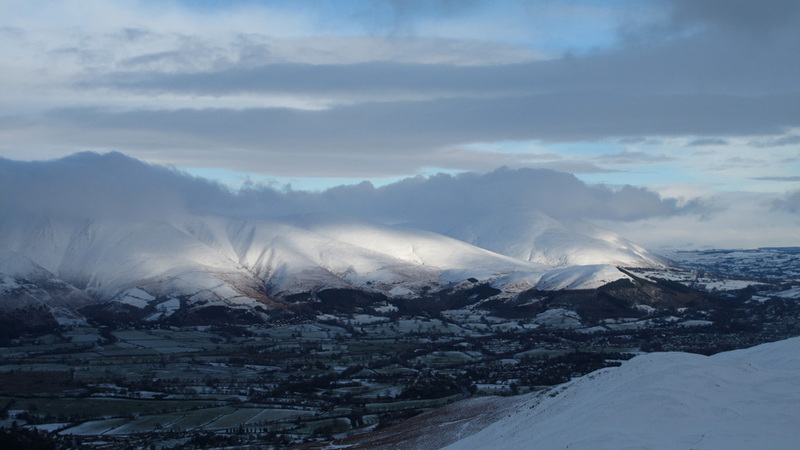 and add scale to this wider panorama of the Newlands Fells. 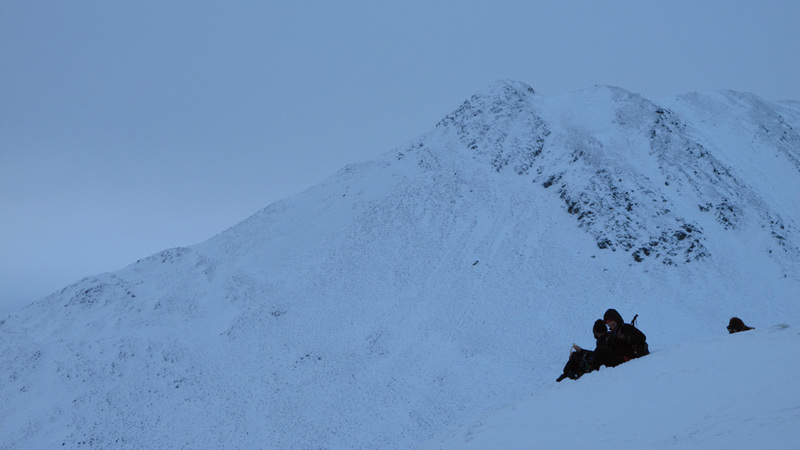 Zooming in, with the wintery outline of Causey Pike behind them. 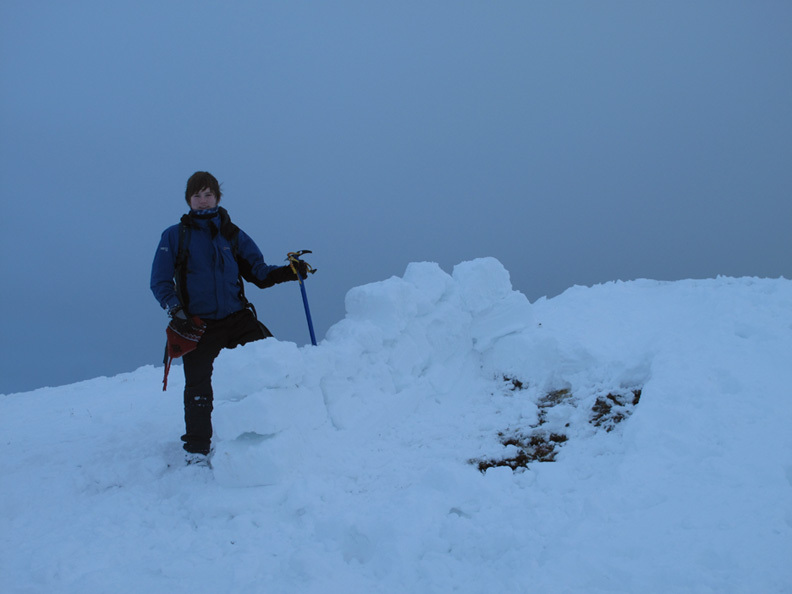 One of the lads has been trying out wall building, cutting blocks from the deep snow with his ice axe. It won't benefit us, but if the breeze continues to rise the next people up will appreciate it. John and David stop briefly to discuss the route for the next part of our walk. Slightly cloudier conditions for us today than Nico and Jan-Willem had on their visit, but this was my attempt at a similar photo. 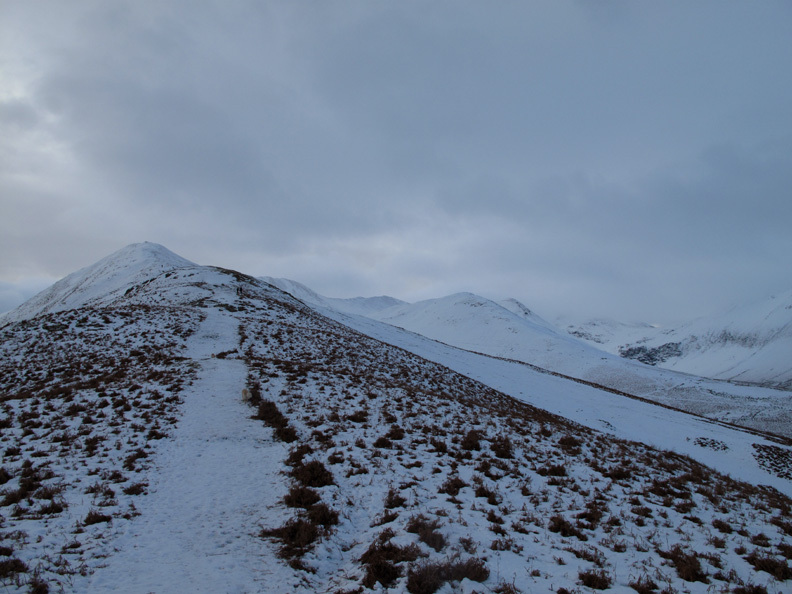 The tops are Causey Pike, Scar Crags and Sail with probably Eel Crag in the far distance behind Outerside. 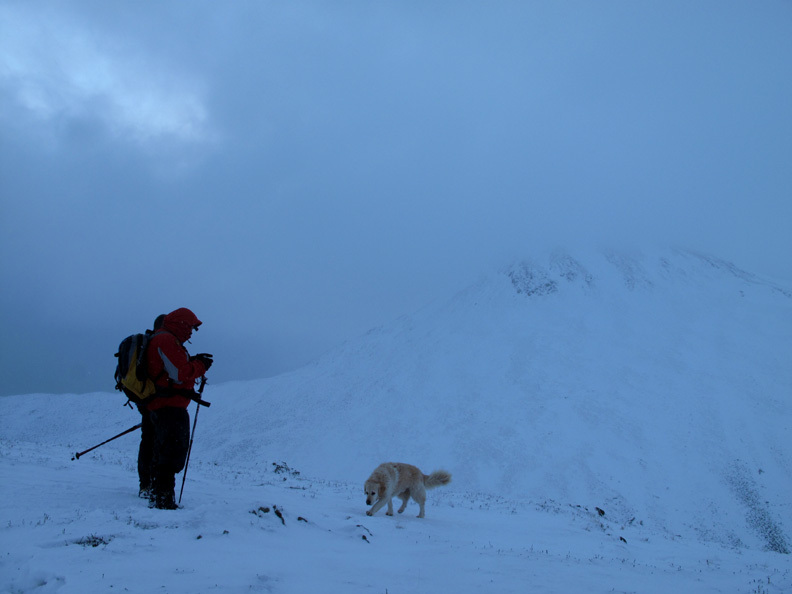 This next passing cloud was a bit lower and as the wind got up slightly it started to snow. The dogs didn't seem to mind. 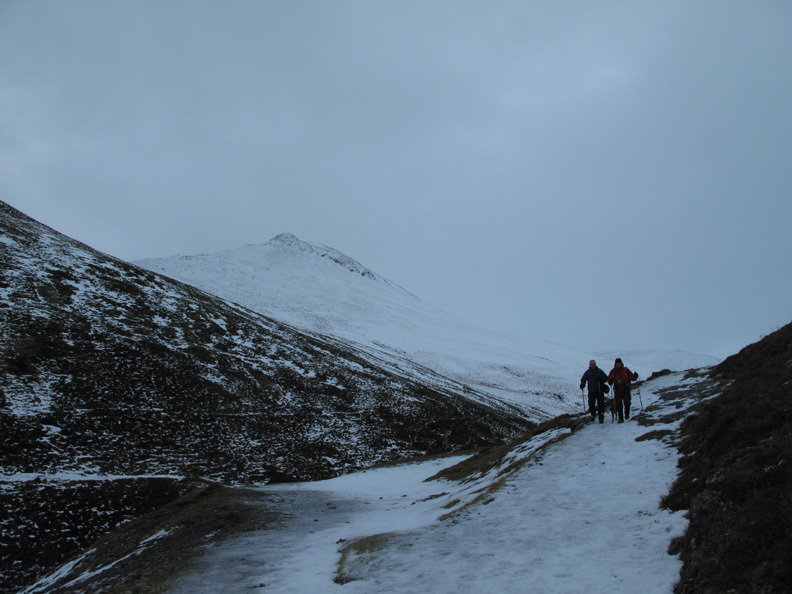 The snow stopped but the bright colours had gone, as we make our way over Low Moss. Somewhere up here there's a small tarn shown on the map. 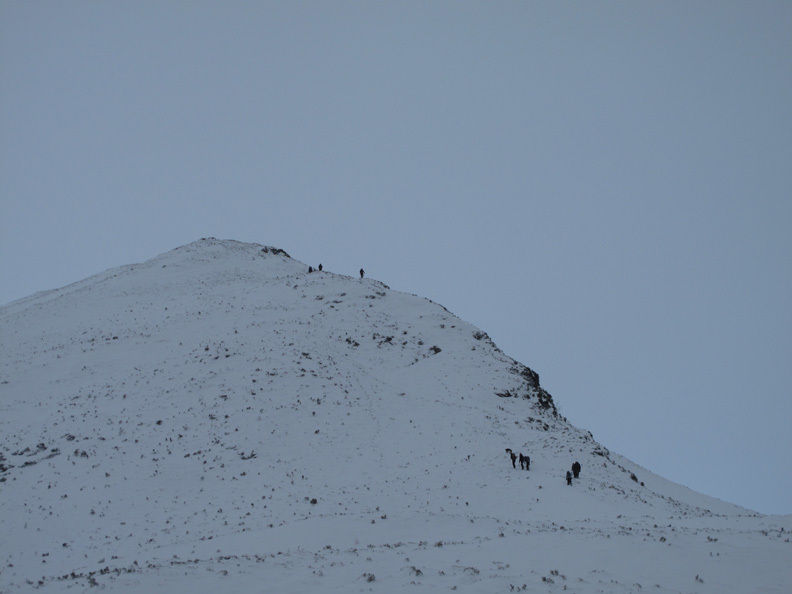 Plenty of people about today, all enjoying the winter snow. 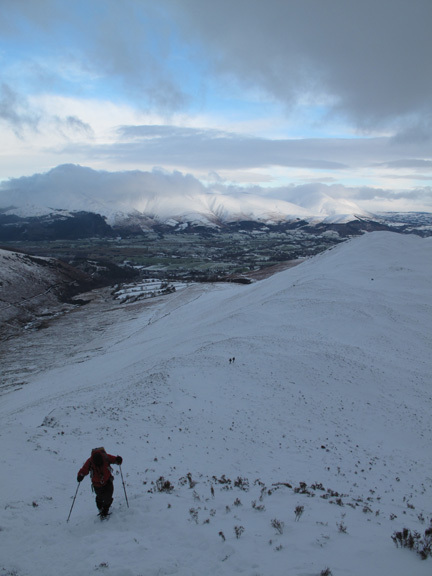 The forecasted blizzard conditions on the high fells did not encourage us and possibly them to climb higher today. 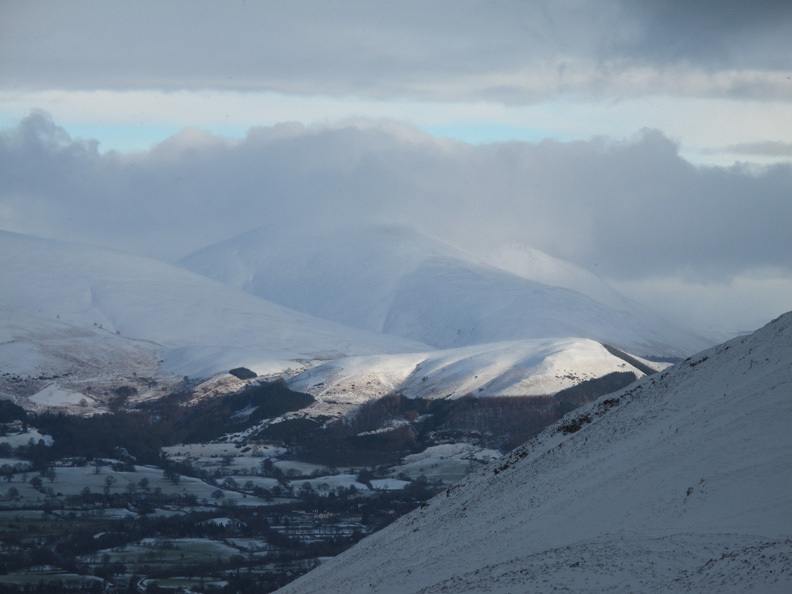 Brighter conditions now over Binsey and the Back of Skiddaw. 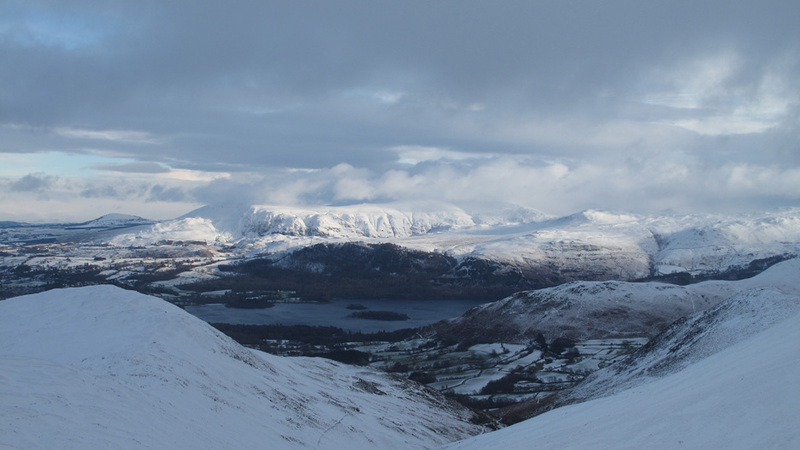 Looking back from the climb, there's more brightness about to the east too as shafts of light fall on Latrigg Fell. John again nearing the top of Outerside. Stonycroft Valley would be our route back. 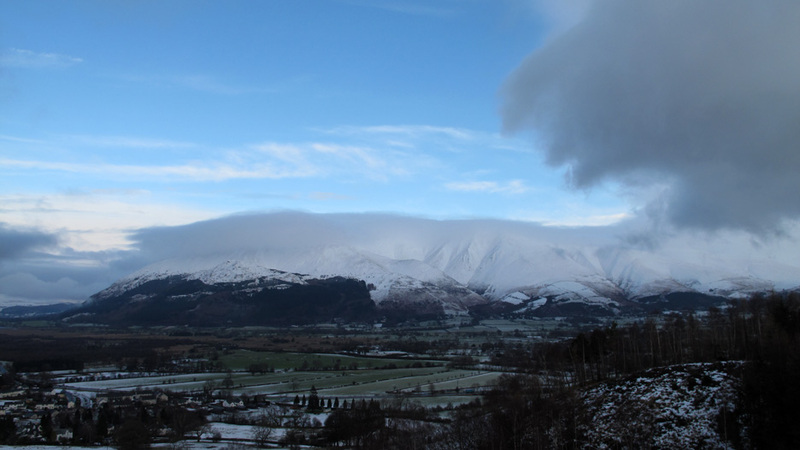 The brightness has spread along the Skiddaw Fells, Lonscale and the flanks of Blencathra. Beautiful sun over St Johns in the Vale too ! 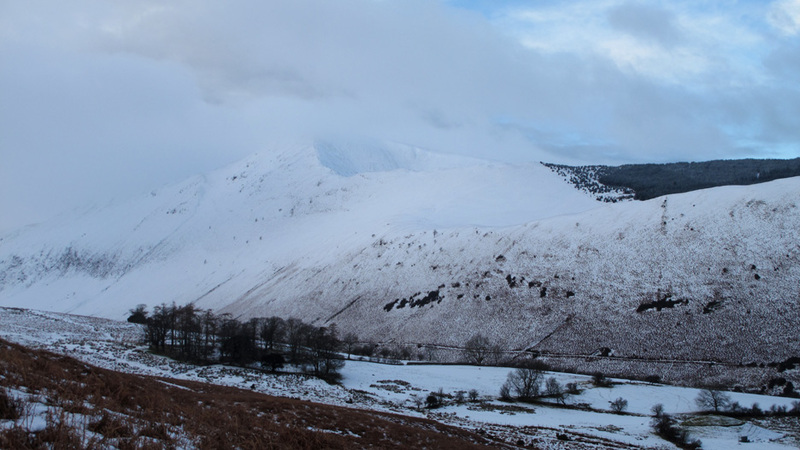 Great Mell fell, Clough Head, Clafhow Pike and the closer Bleaberry Fell all catch the afternoon sunlight. 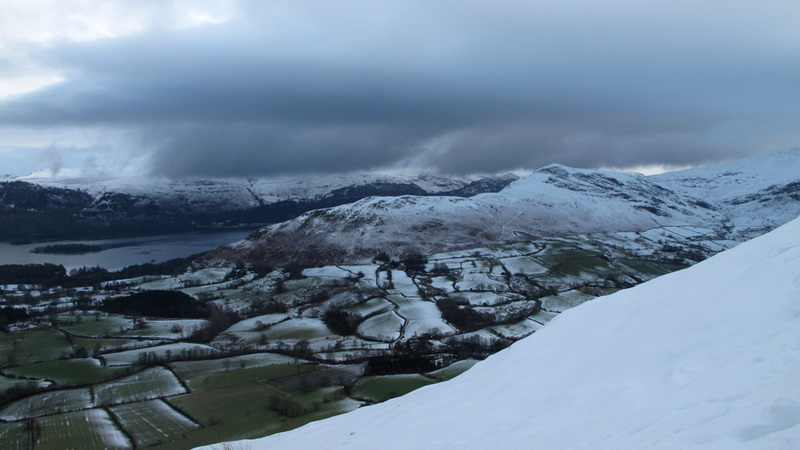 Coledale Hause from the summit of Outerside. 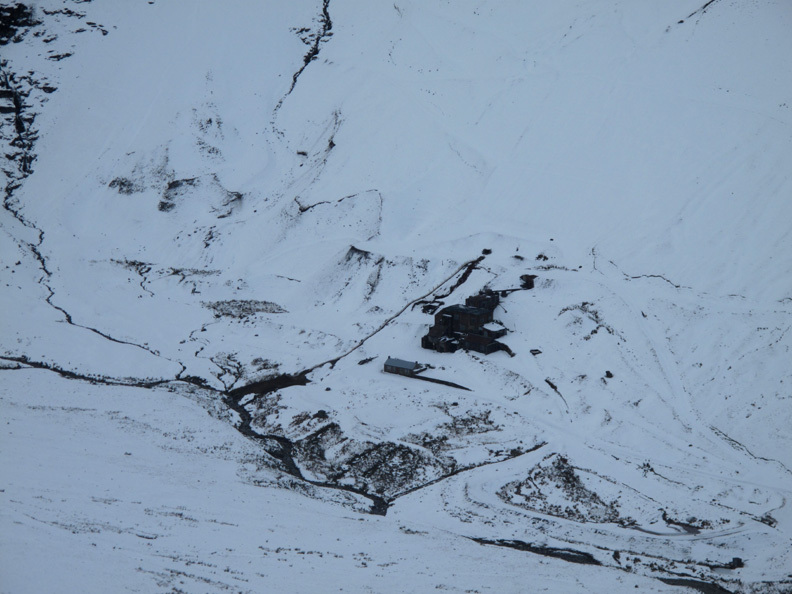 Below us the dark buildings of the old Coledale Mine. Mmmm . . . time for lunch. 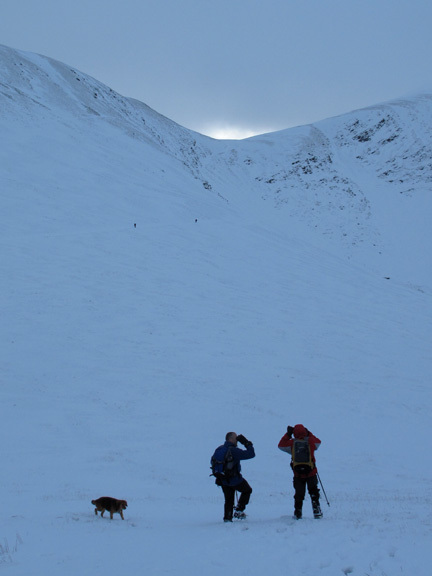 John and David looking towards Sail Fell hause. 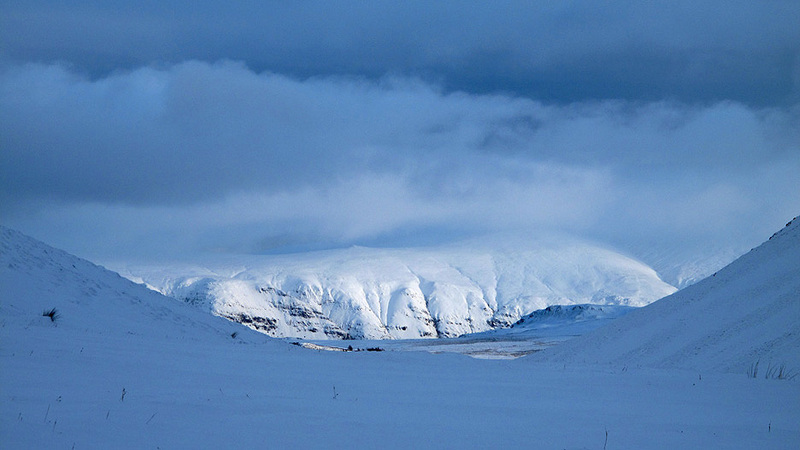 hidden from us by the snow. Navigation in poor weather up here would be a problem. Each of us had different footwear today. 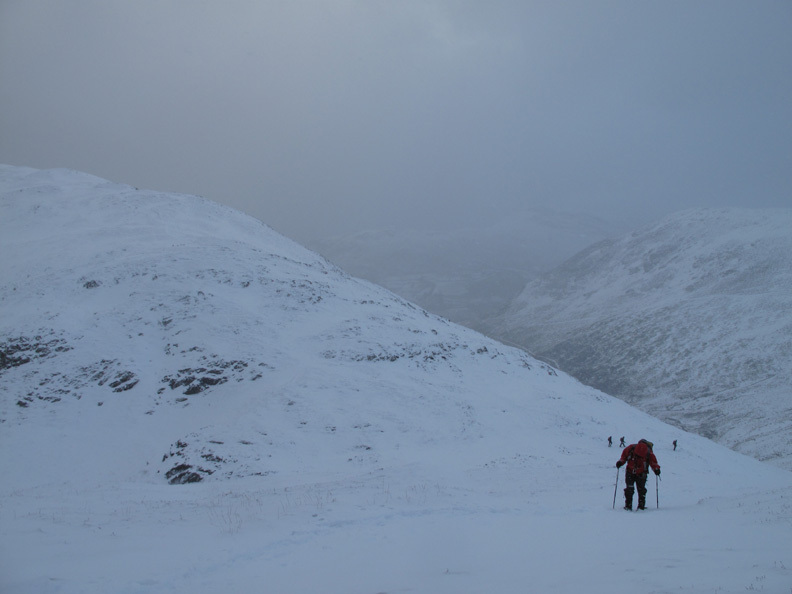 and David had full crampons. and so turned left and headed for the Stonycroft valley. 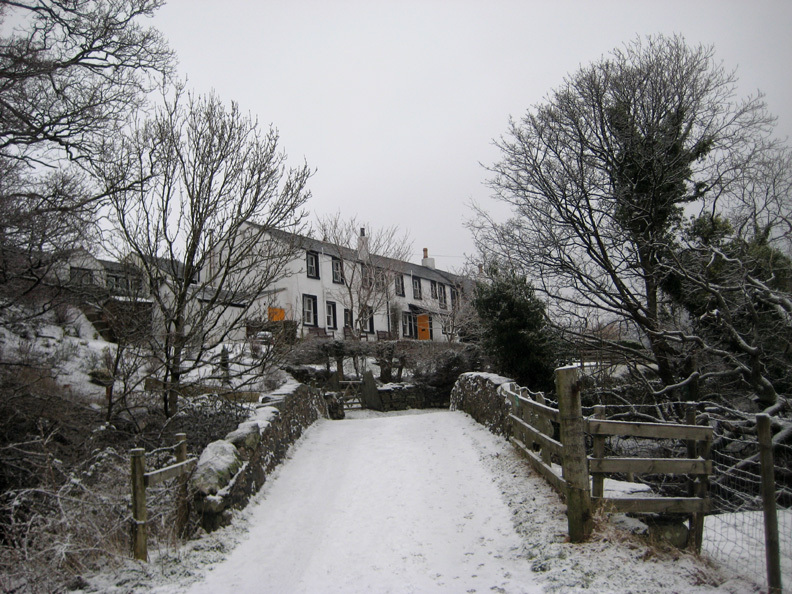 Suddenly the cloud lifted slightly and revealed the dramatic slopes of The Dodds above John's house. 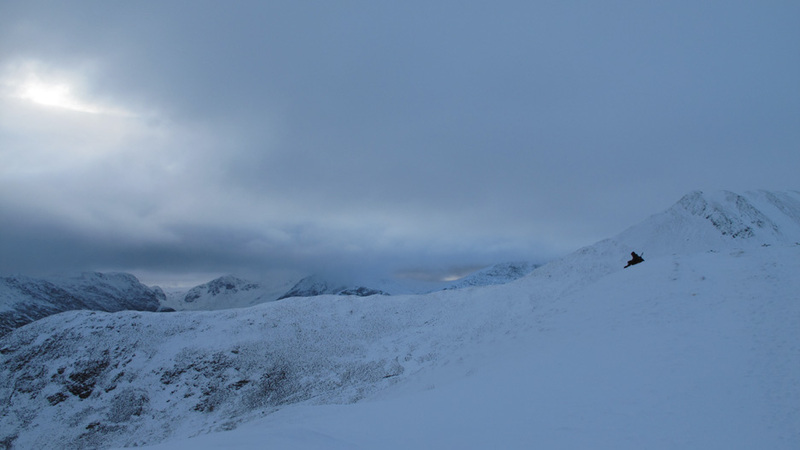 The rocky rise on the ridge, Calfhow Pike, can just be seen but Great Dodd is hidden by that cloud. and Bleaberry's Low Moss, the flat area behind. The path was more evident than it appears . . . The photo fails to show the flat track clearly but just follow Bethan who's out there ahead and trail blazing. 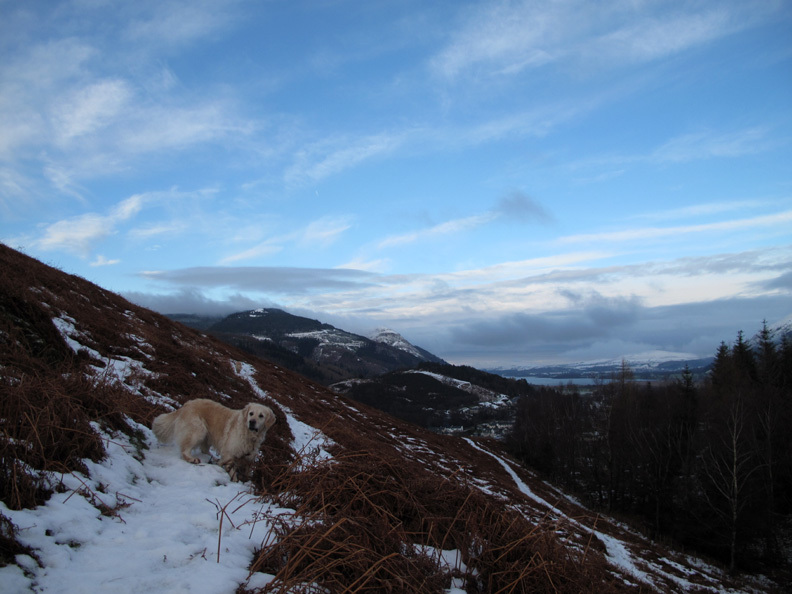 The normally wide and rock path is easy walking today as the snow has smoothed out the bumps. 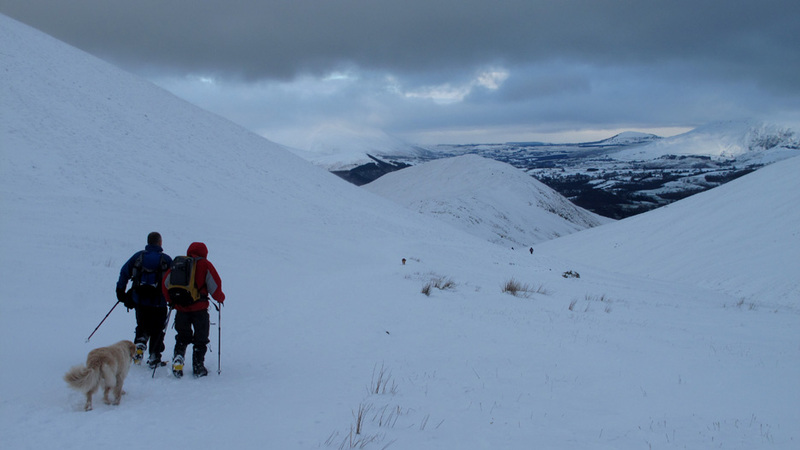 Looking back at our descent path as we leave Outerside behind. normally distinguishable by the spoil heap and colour difference in the surface soil. Back down to the road near the end of our walk. Slight flurries of snow again as we walk back to the cars. Rather than take the spikes off we walked along the ice . . . clear tarmac was not guaranteed ! 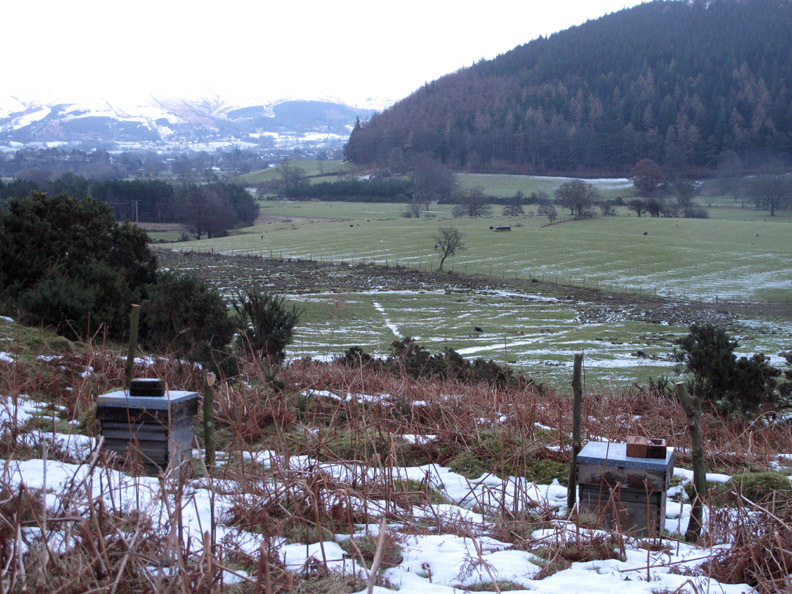 and over the top of two (of about six) bee hives tucked just off the road. 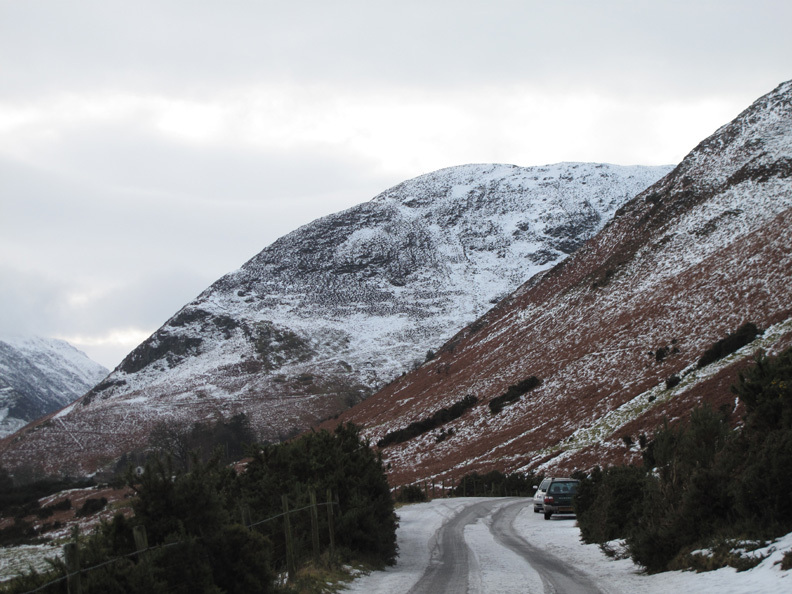 After we said our goodbyes to John for the day, David and I drove back over Whinlatter Pass. 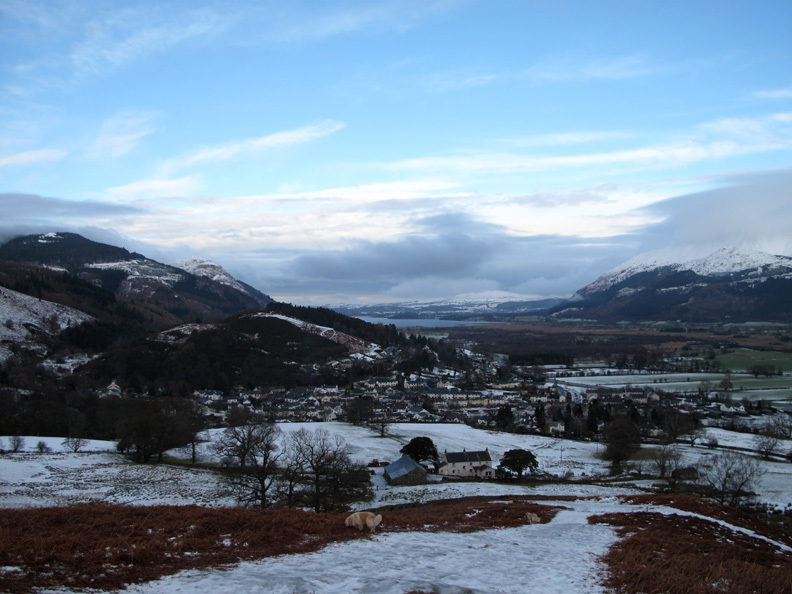 Lovely blue skies over Darling How Plantation, Broom Fell and Lords Seat. Clear western skies have given us an early sunset glow. 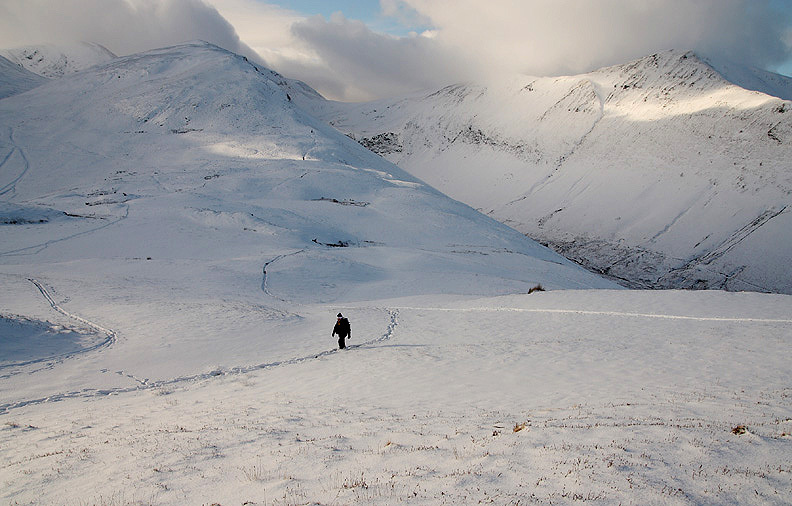 Leaving the fells when we did could be classed as good timing. This site best viewed with . 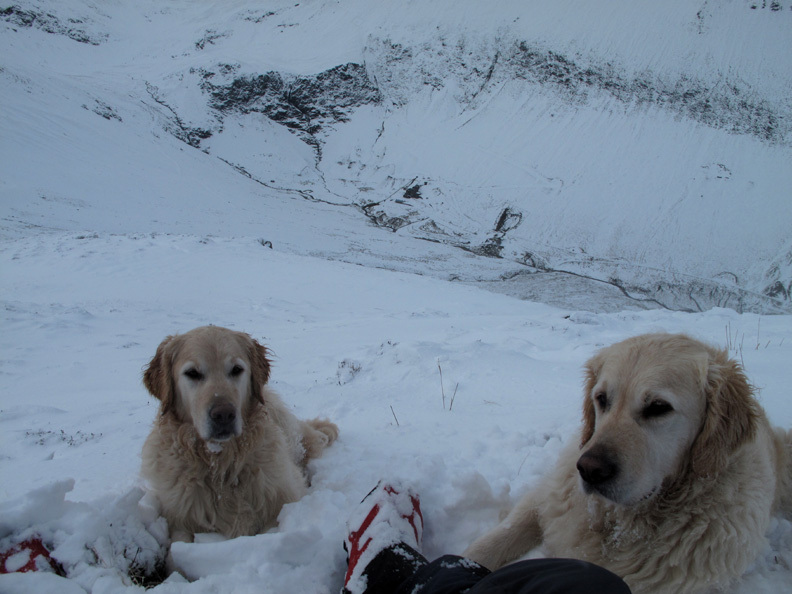 . . an insulated sit-mat for lunchtime ! Click here - for John's or David's photos from today.